In my experience, the offset blanket height is the most critical measurement in the printing unit. Printing is doable if the rollers settings are a little off, or if the ink fountain is not calibrated perfectly. But perfection is required with offset blanket height. If it's off, your life will be miserable, and I don't know about you, but as a pressman, there is already enough misery in offset printing. 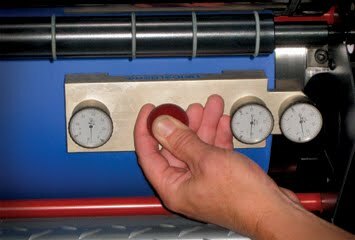 Here are some tips that will help you, the pressman, maintain a proper offset blanket height on your press. This of course assumes that you already know how to achieve the proper blanket height and you are simply looking for the best way to maintain it. Here are some things to watch for. Immediately upon arrival from the factory, check the height on all four corners. It is acceptable to have some variation, but not much. In my experience, if there is a variation of more than 1.5% on any corner I inform the manufacturer. A good offset blanket supplier will take these blankets back and ensure that your pressmen do not get more like this. In addition, storing your offset blanket properly will ensure you do not have variations in height. They must be stored rolled and standing up, not lying flat. It should be a cool dark place. Measuring the height when the blanket is on the cylinder is not so easy though. There are basically two ways of doing it. 1. The first type of micrometer puts a small pin prick into the blanket. Once the pin makes contact with the cylinder, it measures the distance between the offset blanket surface and the cylinder. The obvious disadvantage to this is that it punctures the blanket. You simply have to ensure that it's a part of the blanket where compromising it is not a big deal. 2. The second, and in my opinion, the best is a gauge that measures the height of the bearer and compares it to the offset blanket. This type of gauge is a little more sophisticated, but the principle is the same. Every good pressman has at least one of these two types. Use it. Measuring offset blanket height against bearer cylinder. On our press, we change all the blankets after 10 million impressions. I know that some go as far as 16 million. Congratulations. But the only way our pressman is able to maintain good dot reproduction and meet the ISO standard that we have to is to keep our blankets in top condition. Additionally, we are sure not to over-torque the blankets. This of course will reduce the height slightly. Essentially, the only thing the blanket has to do it sit firmly against the cylinder on the entire surface and not move. That's it. Find our your manufacturer's recommendations for this. Over tightening can also cause premature rips at the gap. There's so much more to say about blankets and how they're made, but we'll pause there for now. Maintain a good height and you will certainly produce good quality offset printing. Good point. I think the reasoning is this: By stacking them flat, you put unnecessary pressure on the bottom blankets. Probably if they were stored this way for months, it may effect the blanket height slightly. I worked at blanket converter and the main reason is for space. A rolled blanket takes up less than a flat and ships alot easier. Also be carefull not to damage the exposed printing face when laying flat. Blankets are better off left in the tube they came in. this will protect them from UV light which will damage the blankets surface over time. This also cuts down on unnecessary handling. I have always stored my blankets in the shipping tube and never have any trouble when it comes time to mount them.shipping them in a tube does take up less space but this is not the sole purpose.Anyone who knows how delicate the surface is should be aware of the need to protect them. Is gasoline good for blanket health?